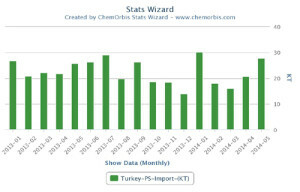 April PS prices from Europe started to be announced with massive increases by the middle of this week, according to ChemOrbis. Although buyers expected to see €200/ton increases before the monomer contracts, a €300/ton spike on the new styrene contract settlements combined with already tight supplies paved the way for larger hikes of between €300-315/ton on PS prices. An initial April styrene contract reportedly settled in Europe at €1370/ton ($1473/ton) on Wednesday. According to a statement on the company’s website, another West European producer also started April with hefty hikes on its PS and ABS prices. The producer increased its GPPS and HIPS prices by €320/ton ($346/ton). However, some buyers are planning to keep their purchasing activity in check during April as they believe the market may change direction to find some price relief in May-June once offline capacities resume operations. 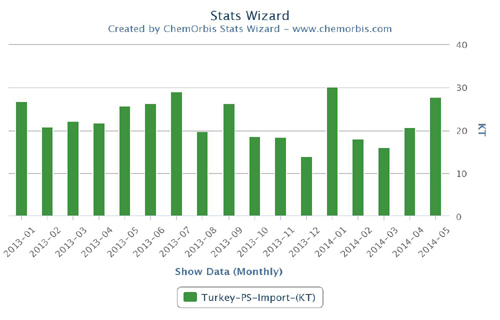 In Turkey, new PS offers for two different West European origins appeared with €300-330/ton hikes month over month today as per ChemOrbis pricing service. Traders attributed the spike to the styrene settlement as well.